Share the post "Out of the Woodwork"
If there ever was a day that was nearest to being perfect, it would have been a day like today. I couldn’t believe how high the temperature rose this afternoon. I didn’t mind it a bit because of the wind and low humidity. I had much catching up of desk work to do this morning so I would be free to get some manual labor done outside while the weather is still pleasant. There’ll be some aches and pains when I get up in the morning due to my not wanting to quit what I was doing until it was finished. I stopped at a convenience store and grabbed a small sandwich before I headed out to my open house in Clear Lake. It’s amazing to see the wide spectrum of people frequenting those places on a Sunday noon hour. You’ll likely think me never going to stop talking about tattoos, but today was yet another example of the crude ways in which people permanently decorate their bodies. One young man standing at the counter had a tattoo in the form of a black chain all around his neck. It looked like a choke chain from a distance. Since he was wearing shorts, his legs were black with all kinds of cryptic designs. Likely there was some sort of meanings or messages in them but likely for only those belonging to his posse of like-minded friends. My open house at 404 S. 9th St. in Clear Lake was pretty much a success. I spent quite a bit of time chatting with a younger couple with children who’re showing some interest in it. The more I’m in that home, the more I have in my mind what it would look like if I were the new homeowner. It would definitely become a “design by surprise” featuring a before and after look for all. Some have considered it needing all kinds of work, but the only work I can see is getting the floor plan back to normal along with painting and decorating. After the main floor would receive a face-lift, I’d attack the basement and create another lower living area where the laundry and ¾ bath would be in a separate section away from the family room. There’s another room under the kitchen that’s away from the basement rec room which I would turn into a tinkering shop area. Most ranch homes aren’t big enough for that much space in the lower level, but this one has it. I hope it sells soon before I start getting serious about purchasing it myself as a fun and rewarding project. The real bonus of the home is the quality of construction. It’s much easier to work on homes that are well built rather than ones that are not. 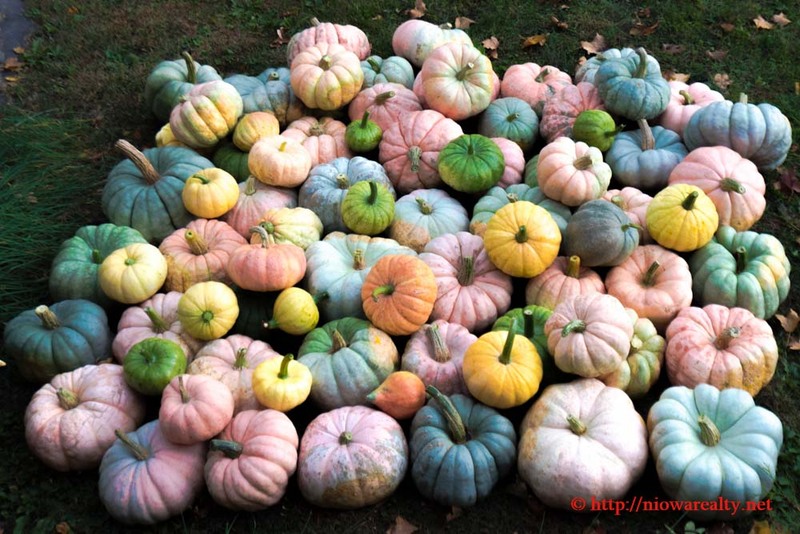 While out and about later today, I discovered a wonderful setting to where I was able to snap a photo of the most delightful pile pumpkins that were just harvested. I’ve never seen such a variety of sizes and colors. Instead of being the normal orange, they were like looking at an Easter egg basket with different colored eggs. The photo above is the one I took and believe me, the colors and sizes are real. Call me crazy and maybe a bit weird, but I think they were likely the most beautiful medley of pumpkins I’ve ever seen in my life. Anyone up for a blue or pink pumpkin pie? Ok, how about some yellow pumpkin bars, or maybe even some green pumpkin cookies? From choke chain tattoos to multi-colored pumpkins, I would say this 11th day of October was full of some of the most curious surprises. It must have been the new Moon causing all these strange visuals to come out of the woodwork.